Every month for two years, she guided parents and their children through Harriman State Park, sometimes for full moon hikes. 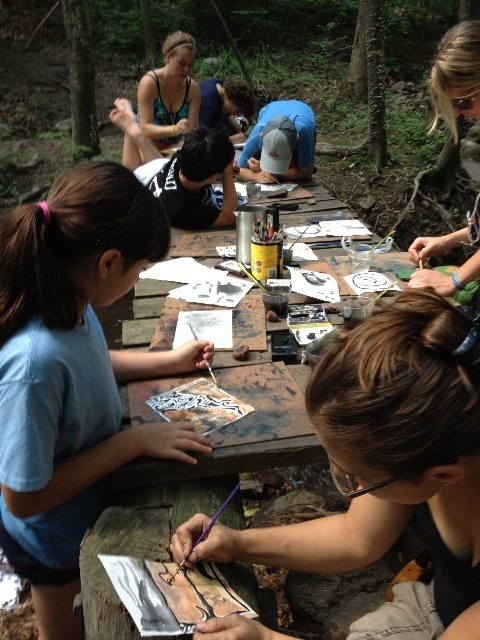 Those forays into nature flowed into Strawtown Studio, a popular nature arts program, that includes a summer camp, afterschool and community programs, now offered along both sides of the river in Rockland and Westchester. 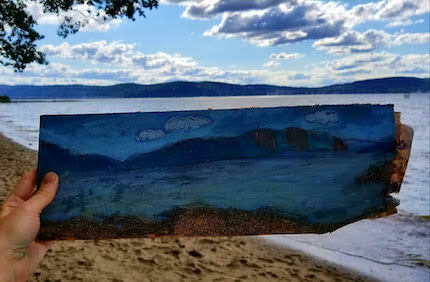 Meet environmental artist, educator and advocate Laurie Seeman. How did you become a nature and art educator? When I first arrived in Rockland County in 1997 with my two small children, 5 and 7, I wanted to gather folks to spend time together outdoors. The Little Feet Hiking Club was started for children and parents. For two years, we went out for hikes every month of the year into Harriman State Park during the day, and also at night under the full moon. I saw how much it meant to the children to have creative exploration time in nature with community. I also saw their natural tendency to create art with nature. The hiking club came to the attention of the Director of the Nature Place Day Camp in Chestnut Ridge, and I was invited to develop an art program for the camp. Over three years, I developed the first Earth Art with Children programming with a talented staff of 5. Based on the great success of the Earth Art program, and the camp leadership training I gained, I saw the need to take it further and turn it into a full summer program. For two years we held family workshops, and an after-school program there, with woodlands, grassy meadows, wetland habitat, and the Hudson River, with all it’s life to inspire us. In 2015 we returned to Marydell and are now expanding our programs!. Marydell is where I met Joanna Dickey. She first came on board as a summer staff artist, and now 15 years later we have spent thousands of hours outdoors together leading programs and developing Strawtown. 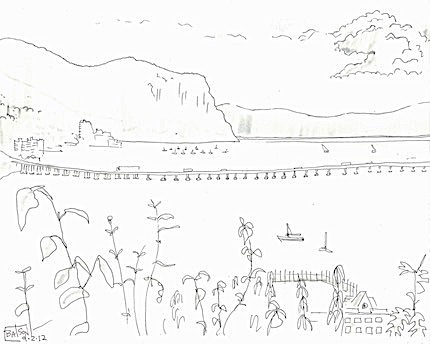 Joanna grew up in Upper Nyack within blocks of the river and she always says that she never knew the amazing things about the river before she came to Strawtown. Children paint on a bridge with the sounds of a stream running under them. Why do you call your program Strawtown Art & Garden Studio? 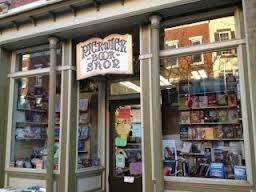 I was living on Strawtown Road for many years, in West Nyack. I liked the word Strawtown. Straw has since become symbolic for us. When you peel the dry outer layer off straw you find shining gold inside! “Straw” also represents nature, and “town” the people. I understand that you were in the art world before you became an educator? I worked as a contemporary Art Dealer and Curator in NYC with my life long friend Wendy Cooper during the art boom in the 80’s and 90’s. Known as Cooper Seeman, we curated shows, and advised clients in building their art collections. I thought it was the greatest work in the world, but does not compare to working outdoors with children. My own art is all about listening in and responding to the natural world around me. I create art from plants, make pigments from rocks, look closely at the ever-changing forms of nature. I also stage the outdoor studios that we spend time in and design the lessons. Creating and developing the programs is my art too. Then there is the distinction between earth art and environmental art, where the environmental art aims to communicate, educate, activate. What life experiences informed your environmentalism? Painting with pigments made from ground wet rocks and Japanese ink. When I was 7, we moved to a neighborhood in Endwell, NY on the edge of a meadow where a creek meandered below. The creek became my best friend. A half-mile south there was a shale ravine with tons of fossils. I have now come to realize I grew up in the Marcellus Shale area. When I was 10, bulldozers appeared one day and they engineered my creek to accommodate a big tunnel for a nearby road overpass. It was shocking. I have since learned a whole lot about creeks and waterways, and that straightening a stream is detrimental to the health of the stream. I advocate for two streams in Rockland in particular right now.The Sparkill Creek, with the Sparkill Creek Watershed Alliance, which I was founded in 2010 in response to a Strawtown class experience in the creek, when a young student remarked about her concern for the creek. You can read the wonderful story on the website sparkillcreek.org. 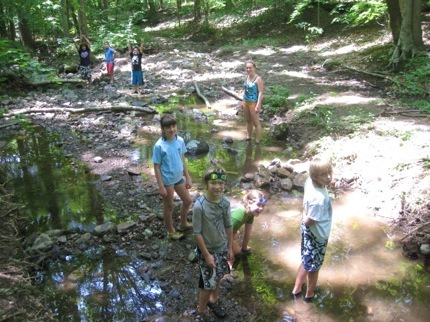 I also have a strong relationship with the Minisceongo Creek in Haverstraw, it’s one of our outdoor classrooms. This creek is the site of a citizen science eel migration monitoring project with the NYS Department of Environmental Conservation. The youth of Haverstraw have joined us in this aquatic study for 4 years, and it’s the greatest way to learn. This is s a two-month project each spring, opened to all interested, and it is underway now. What can you tell me about the life of the Hudson River near here? 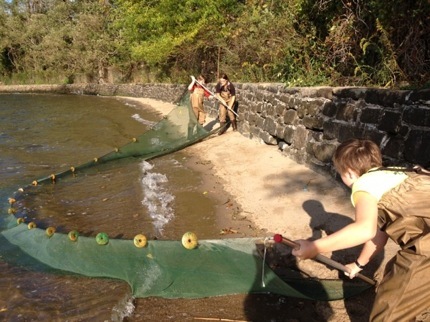 Working with a sein net, children learn who lives in the Hudson River. We live in the Wide Bays area of the river with Tappan Zee and Haverstraw Bays. The widest span of the river is Haverstraw to Croton, 3.4 miles across. Haverstraw Bay and has been designated the most “Significant Coastal Fish & Wildlife Habitat” of the Hudson River” by the New York State Department of State Division of Coastal Resources. So few people know this, or know that this region area holds 5 of the 40 rated significant habitats, the others are; Piermont Marsh, Hook Mountain, the Hudson Highlands, and Iona Marsh. When I learned this I advocated to have this area listed in our County Comprehensive plan, which never before had never listed the Hudson River as one of our precious natural resources. Strawtown teaches on both sides of this extraordinary river area. 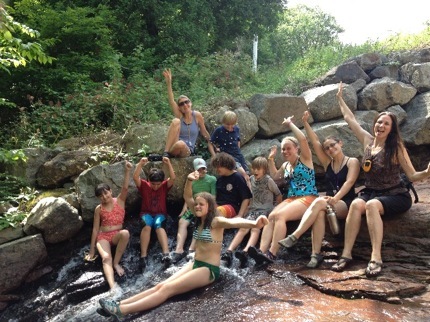 We love giving the river kids and their families the opportunities to explore and learn right along with us. No two days or outings are alike! 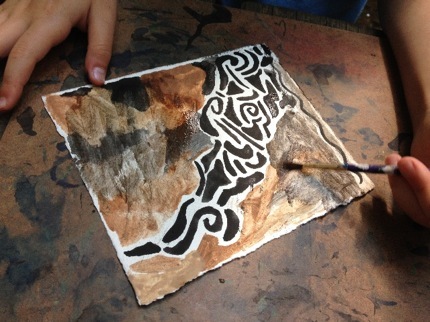 What do you see is important about the role of art in nature education and advocacy? Laurie Seeman ( far right) and Joanna Dickey ( 2nd from right) with students. Art provides a way to come to a greater understanding of nature. When making art we can realize more than we would by breezing by on a walk. We take time to look closely, to take materials into hand, to observe relationships, and then to respond. Through time for reflection with nature and art we can discover our “ecological self”. So important for these times. Art is also a way of seeing new possibilities. It opens up the way for new thinking, problem solving, strategy and communications. It also can brighten the difficult day! 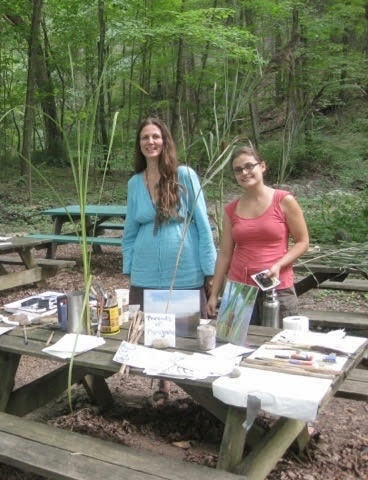 In many ways the importance of the nature and art connection travels out of the classes. What we learn with the children is what informs my ability to speak for the natural world in public places, and with decision makers. When I go out regionally to speak for our waterways I always think, “It’s not enough to take care of the children, we have to take care of the world they live in too”. What are your plans for this year’s Strawtown Summer Program with Children? To go out to discover the world with friends, create all kinds of art, and find answers to our three leading questions Where are we? Who are we here with? How are we all doing together? The questions nearly say it all! Space is still available for the Strawtow’s After School Program and Summer Program for children ages 7 – 12. The summer program runs for 6 weeks from July 2 through Aug. 9: Mon. – Thurs., 9:30a-4:00p (1st week is Mon-Fri, skip 4th July). An activist, artist and writer, Bill Batson lives in Nyack, NY. 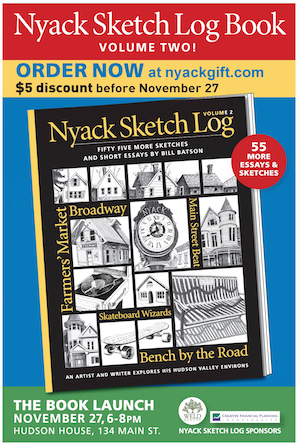 Nyack Sketch Log: Kids Explore Nature & Art at Strawtown Studio © 2018 Bill Batson. Visit billbatsonarts.com to see more.